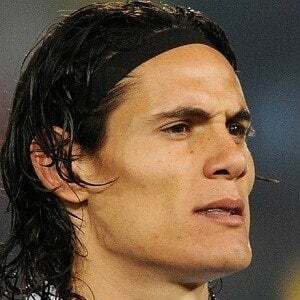 Uruguayan striker who joined Paris Saint-Germain in 2013 after spending three years with Napoli. He became a member of the Uruguayan national team in 2008. He first gained interested from scouts after his strong showing in the 2007 South American Youth Championship. He scored more than 30 goals in each of his first two seasons with Napoli and led them to the Copa Italia in 2011-12. His older brother, Walter Guglielmone, also became a professional soccer player. He had two sons with Maria Yarrus, to whom he was married from 2007 to 2014. In 2012, he was rated the 10th greatest soccer player in the world by the Guardian newspaper; Yaya Toure ranked just ahead of him at No. 9.